Use the compatibility fixes to fix issues with the interface frame rate and windowed mode on modern versions of Windows. 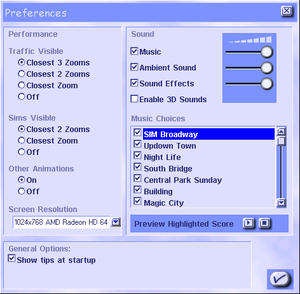 SecuROM DRM for the original version. SafeDisc DRM[Note 1] for Unlimited. Linux version only has the Unlimited release, while the Machintosh only has the original release. Use the -intro:off command line argument. Requires the CD of Loki Software's Linux port. The following python script allows you to install the game into the modern Linux system much easier, which can be found here. Works only with Ubuntu and Debian or any distribution based on these two. The latest patch (v1.1) updates the game and adds the Building Architect Tool. This patch is also available for the World Edition and Linux. 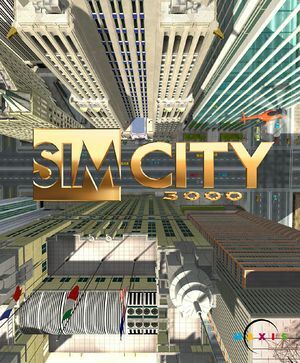 Cities (*.sc3) can be saved anywhere; this is the default location. The game must be running in 16-bit color mode (you can use the compatibility fixes to apply this). Use the command line argument -w -r:800x600 (replace with the resolution you want). Music, Ambient Sound and Sound Effects. Use the compatibility fixes to fix issues with interface frame rates on modern versions of Windows.